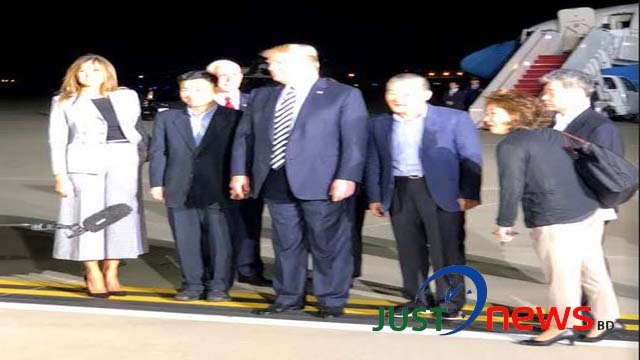 M Mushfiqul Fazal from Washington, May 10 (Just News): The United States President Donald Trump made the impossible possible one as three American detainees freed from arch-rival North Korea and landed safely to their home on Thursday. The whole world observed this dramatic change with the North Korea and fruitful diplomacy of the USA. The President with the First Lady Melania Trump warmly welcomed the three great Americans at the Joint Base Andrews early morning . 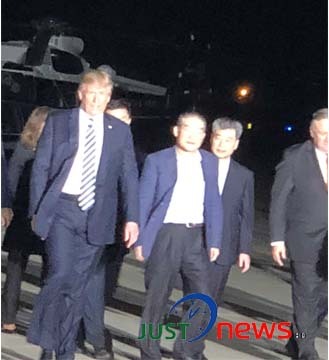 The plane bearing the returnees from North Korea landed at Andrews Air Force Base at 2:42 am. After landing, the plane bearing the returnees from North Korea taxied towards the large American flag backdrop. It came to a stop at 2:49 am. 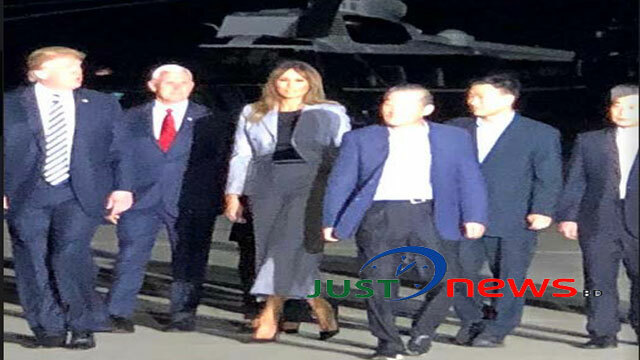 President Trump left the terminal four minutes later and walked towards the plane accompanied by First Lady Melania Trump, Vice President Mike Pence, and Second Lady Karen Pence, and Secretary of State Mike Pompeo. 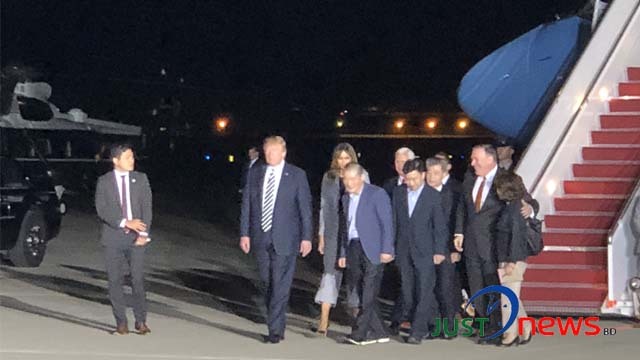 The president and the First Lady boarded the plane at about 2:54 am. The Pences and the Secretary of State remained on the tarmac. 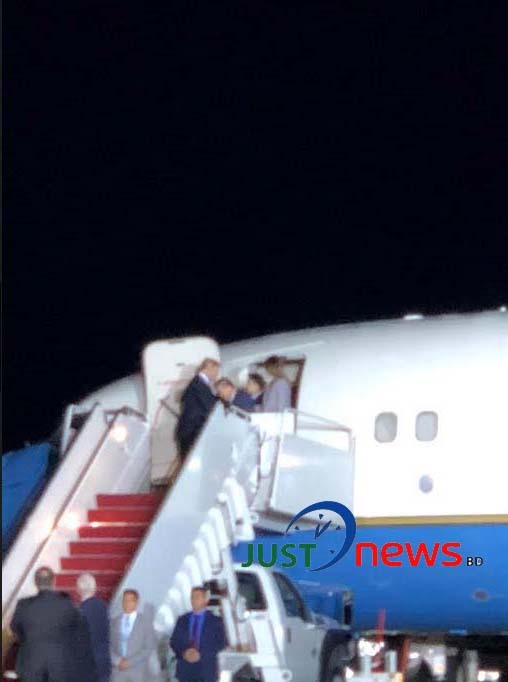 Trump walked onto the steps outside the plane at 3:00 am accompanied by his wife and the three proud American returnees. They shook hands. One of the men pumped his hands in the air as Trump clapped. About two minutes later, Trump brought the men up to the assembled reporters and they all spoke to the press for over seven minutes. “I think our Secretary of State, despite the fact that the New York Times said he was missing -- he was in North Korea -- but I think our Secretary of State has done a fantastic job. Mike, did you know that you were missing? They couldn't find you. They couldn't find him. They couldn't find him because he was in North Korea,” he added. Three detainees are, Kim Dong Chul, Kim Sang Duk (Tony Kim), and Kim Hak Song.